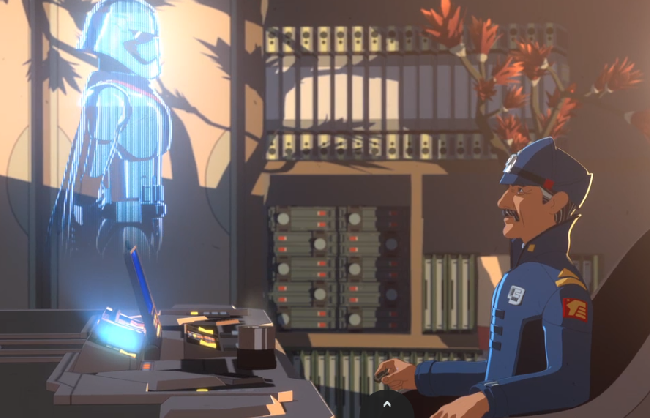 Star Wars Resistance - "The Children From Tehar" Review! Other than this revolving door opening where Kaz’s lack of mechanical skills forces him out of the shop, this was another great episode, so that makes it two in a row! Hopefully this is now officially a trend and Resistance is starting to find its footing. Back to the episode. We start off with Kaz breaking a very delicate piece of equipment, an acceleration compensator, and promises Tam he’ll replace it. Only trouble is he doesn’t have any credits, so he goes to Aunt Z’s to drown his sorrows with water, which Neeku pays for. 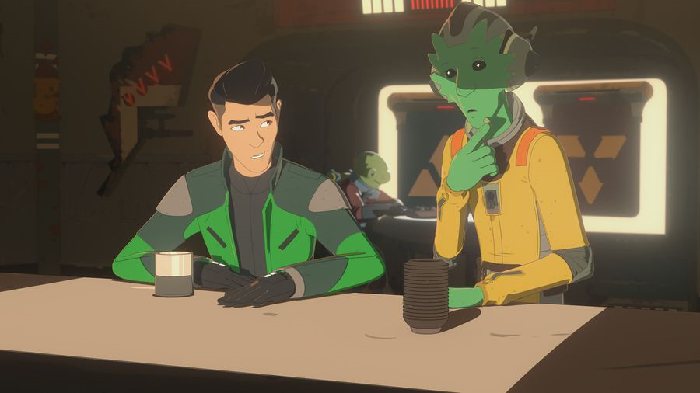 While there, he and Neeku overhear two patrons talking about a 20,000-credit bounty for two missing kids (Kel and Aayla). The kids are sporting a strange symbol which Kaz seems to recognize but offers no explanation. They decide to look for the kids as that would solve all Kaz’s financial problems. Out in the market, they spot the kids when they are caught stealing some food, but they lose track of them on the streets. Realizing they need help finding them, Neeku takes Kaz to the “Engineers” (think the Mystics from “The Dark Crystal” meets “Squirtle” from Pokémon) in the lowest level of Colossus. They are large turtle-like creatures called Chelidae who are responsible for keeping Colossus running. They are the eyes and ears of Colossus and agree to help Kaz by keeping an eye out for the children. Captain Doza sends 4D-M1N to bring Kaz to the tower for a meeting, basically to size him up. He asks about the bounty on the children and accuses Kaz of being a mercenary. Kaz of course denies it and says he just wants to help them. Doza doesn’t really believe him and sends him off. After Kaz, Neeku and BB-8 leave, he calls Captain Phasma to tell her the children are on Colossus but wants to know what’s so important to warrant such a large bounty. Phasma says the children are from a very high-ranking and wealthy family from the First Order but nothing more. Doza says he’s providing this information, not to join the First Order or accept their deal, but just to improve relations between them. We cut to the kids who are hiding out and tending to Aayla’s injuries which she got when they ran away from Kaz earlier. Meanwhile, back at the shop, Neeku receives a message from the Engineer’s that they found the children. Tam makes Kaz take the damaged compensator with him. They go to the lower level where the Engineers have taken the kids. They explain to Kaz that they are not lost, but runaways from Tehar, and the only survivors of a village that was destroyed by Kylo Ren and his army. Kaz informs them that Kylo Ren works for the First Order and promises to keep them safe. They hit the market to find some natural herbs to help Aayla with her injuries. 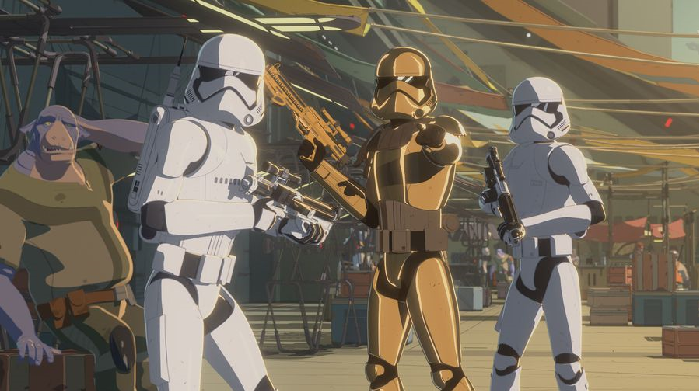 It’s then we see Commander Pyre (very cool looking) and two Stormtroopers whom Phasma sent to retrieve/kill the kids. They are spotted, and a chase ensues. They manage to make it to the lower levels but are trapped in the Engineers shop while Pyre is trying to open the blast doors. They make it through the blast doors, but rather than being taken, the kids jump through an open grate to the cold ocean below. They scan the waters and show no signs of life so Prye informs Captain Phasma that the kids are dead. She says, “Excellent, now the name Tehar will fade from memory. Our plans will remain safely out of the reach of the Resistance.” They are ordered back to base. We learn that the kids are safe thanks to the Engineers who were already in the ocean below and have slowed their life signs enough to trick the First Order, which was the plan. The kids are safe for the time being and will stay with the Chelidae for a while. Back in Captain Doza’s office, 4D informs him the First Order have left the platform as he stares intently at the symbol that the kids were wearing on their clothes. It seems he knows the symbols origin. Back at the shop, Kaz gives Tam the compensator that the Engineers fixed earlier, he then goes to his quarters to call Poe Dameron and tell him what he knows. Ello Asty answers and explains that Poe is out on a secret mission. Kaz tells him about the kids, Tehar, Kylo Ren and the First Order where Ello says he’s never heard of Tehar and it must be somewhere in the Unknown Regions. He compliments Kaz on his good work and says General Organa will want to hear this intel immediately. Like I said, another great episode with intrigue, world building and character development. The First Order are key players now and Captain Doza continues to blur the lines. He’s not with the First Order, it’s stated as such, but he’s clearly got questionable motives and enough power that keeps the First Order under his thumb somewhat when they are on the platform. I appreciate the fact very much that the humor is starting to fad into the background, something I mentioned after the first episode that I wasn’t comfortable with. As the stakes get higher, there’s simply no place for comedy so hopefully going forward they use it sparingly. 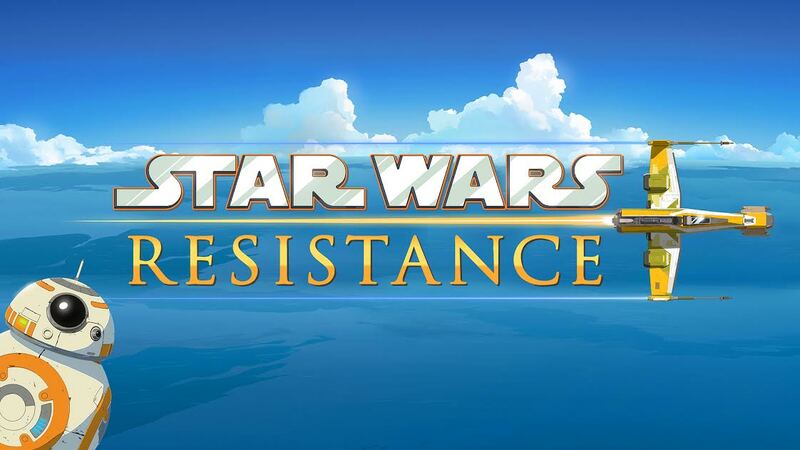 We know the events of Star War Resistance will bleed into The Force Awakens and if you recall, the First Order’s mission was to locate the map which would lead them to the location of Luke Skywalker. That brought them to Jakku where we saw Kylo Ren, Phasma and a squadron of Stormtroopers kill Lor San Tekka and wipe out the Tuanul settlement, killing everyone in the village. The children’s story rings very familiar to that one and that symbol could be that of the followers of the “Church of the Force”. It would make what Phasma says in the episode relevant to those events we saw in The Force Awakens. Also, we know from ancillary products like Charles Soule’s Poe Dameroncomic book series that Poe spent a considerable amount of time flying around, looking for clues as to Skywalker’s whereabouts. He did so with the help of Tekka who gave him possible starting points. Could Tehar be one of those locations? Of course, this could have nothing to do with any of that and we’re back at square one! But that’s the fun part of this mystery. Either way, the series is gaining some serious traction for me and I very much look forward to what’s next. Also, I loved the Chelidae who reminded me of the Mystics from 1982’s “The Dark Crystal” and I’m hoping we see more of them in the future. This is great because Poe is back and we’re getting off the platform! Whether it’s off Castilon or not we don’t yet, but I’ll welcome the change of scenery that’s for sure. What kind of ship do they find what are the “strange lifeforms” will be most interesting I’m sure. It will most likely only add to the intrigue and perhaps explain a thing or two about why the First Order is so interested in Colossus.